Adeline Loh left her comfort zone far behind, went tramping into, what was for her, unknown Zambia, and came back with a book inside her. A FEW YEARS AGO, Adeline Loh took a break from her job in publishing to travel around Zambia. Upon her return, she wrote Peeing in the Bush (MPH Group Publishing, January 2009), a funny, bordering-on-scandalous account of her adventures in Africa. Peeing in the Bush is Loh’s second book; the first was Don’t Sit on This Book, a collection of quirky Chinese taboos, co-written with feng shui master Philip Cheong. Now “scheming her next big adventure,” Loh talks to us about life before, during, and after Peeing in the Bush. in her well-received travelogue, Peeing in the Bush. Some of the funniest moments in Peeing in the Bush may not have been so funny when they were happening. Which part took the longest before you could look back and laugh? Definitely the time when the van broke down in the middle of the night, and I was stranded in the bush with my hopeless tour guide, Daniel, and driver, Steven. I really feared for my life then, especially when we had to walk back to our camp without an armed scout. I panicked even more when Daniel did not seem to be very sure where we were heading. Dozens of real-life safari horror stories swam in my head, and I seriously thought I was going to get eaten by a lion or gored by a buffalo. During your travels you jumped with both feet into several adventures that even you acknowledged were borderline insane. Was taking every interesting opportunity that presented itself something you had decided to do on this trip or is it more of a life philosophy for you? When did you decide to turn your trip into a book? A couple of months after I returned from Zambia. I was seeking a more meaningful direction in my life, and decided that I wanted to do some creative writing. At the same time, I had what you could call an “African hangover”, which made me reflect obsessively about my trip. Nobody I knew understood what was so great about my trip or where in the world was Zambia. So I thought, why don’t I write about it and tell people about the wonders of this country? It was when I started to work on it that I knew a book was taking shape. Mostly because I think Chan and me were hilarious together. What about the delightful and eternally sensible Chan, your travel companion? Will you two be having more adventures together or do you think Zambia will last her a lifetime? Last I checked with her, Zambia will definitely last her a lifetime! She was completely broke when we came back so it will be a while till she has enough money to travel again. Will you be going back to Zambia? Yes, I will. When I have finished exploring the other 190 countries in the world. I just have to ask: much of your book, including the title, goes into great details about bodily functions, both human and animal. Again, is this something that just featured largely in this particular trip or is it something that has always held a particular fascination? This is such a great question! Truth be told, I never really noticed it myself! It was just so natural for me in the course of writing the story that I put these details down. Somehow, I had fantastic recollection when it came to those things so I guess I am pretty fascinated. Oh no, do I need therapy now? Indeed, toilets and dung featured largely during this trip, and I thought people might like to know. Having said all that, I do enjoy toilet humour! What kind of feedback have you had from fans? Well, the book was only unleashed unto the unsuspecting public sometime end November 2008. And then I was having adventures in Belize the whole of December where I was completely cut off from all modern means of communication. So I really haven’t had the chance to hear a lot of feedback from the fans. But all my friends seemed to love it! And their friends in turn couldn’t stop giggling throughout! Has there been any reader response that has particularly affected you? Well, just knowing that people are enjoying the book and laughing their heads off has pleased me no end. I can’t tell you how happy I am when I’m making other people chuckle. Your book makes one want to follow your lead, and trade in a humdrum life for a real one. What do you say to those who feel this way? Wow, that is so cool to hear that I have managed to make people want to follow my lead. My advice for those who want to trample into the unknown is to leave your comfort zone behind. Expect the unexpected and try not to be too grouchy when things break down. That way, you will be more open to new experiences and enjoy yourself while you’re at it. What is your next big adventure? And can we expect another book out of it? I have tons of adventures lined up, but first, I’ll have to find a new travel companion! Any takers? I’ll only write another book if it can top my Zambia trip. Honestly, I think Peeing in the Bush is pretty hard to beat! "I think Chan and me were hilarious together" and "I think Peeing in the Bush is pretty hard to beat" certainly convinced me. I must purchase this book. Glad to know that you enjoyed Adeline Loh's book. Thanks for your feedback. I'm a resident of Singapore and must congratulate you for publishing Adeline Loh's Peeing in the Bush. To my delight, I came across the book in my local library and found it such an interesting read. 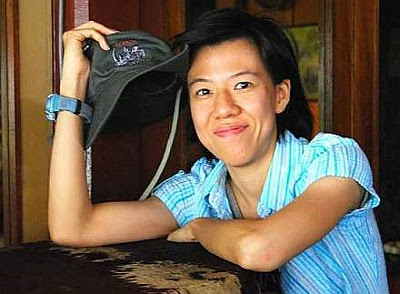 I have never heard of Adeline Loh until now. What a creative and exciting writer! Take the last sentence on page 13 for example, when she compared her brief breaks overseas with free shampoo samples. How I wish I could conjure up such metaphors. Please convey my sincere best wishes to Ms Loh.